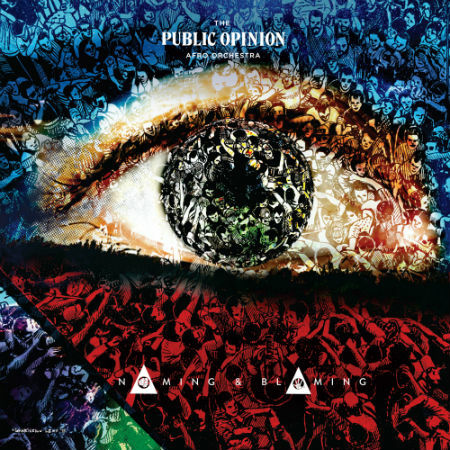 After a long wait, Melbourne’s Public Opinion Afro Orchestra (The POAO) is set to release their second album, “Naming & Blaming”, a pulsing, percussive journey into classic afrobeat. Recorded by a 17 piece ensemble, led by fierce vocals and a howling horn section, it’s a fitting 21st-century response to the world- shaking music of 1970s Nigeria. The result is true to the afrobeat blueprint of hypnotic, extended songs, improvisation and political comment but adds to the formula a host of pan-African influences and hip-hop elements that reflect the deep ranging roots of the band. As the title suggests, and in true afrobeat tradition, “Naming & Blaming” pulls no punches. It is an outspokenly political record, a cauldron of strong opinions where indignation and optimism coexist. Led by the vocals of MC One Sixth and singer Lamine Sonko, the critique of colonialism is applied to both the African and Australian experience, the battles of many cultures informing the group’s ethos as does the importance of community and staying true to one’s convictions. Uplifting visions of a brighter possible future as laid out in “No Passport”, the album’s rambunctious opening song, are balanced with honest reflections on injustice like guest Robbie Thorpe’s take on Australia’s chequered history in the title track. For the “Naming & Blaming” cover, the band was honored to have the opportunity to work with one of the originators of the Afrobeat movement Lemi Ghariokwu, the legendary collage artist and illustrator responsible for all of Fela’s most famous album covers of the 1970s. This relationship is what The POAO is all about, paying respects to the culture and keeping it alive and relevant in the 21st century. Over the last decade, The POAO have established themselves as a firm festival favorites with their contemporary approach to Afrobeat.